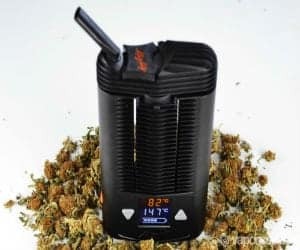 Mighty Vaporizer Review - One Hell of a Kickass Vape! A glorious good day to all you gorgeous vapers and dry herb vapers out there who’re on the hunt for the next big thing to add to your extensive vaping collection or indeed, to start your non-existent collection with! Now this week, when I say BIG thing, that’s exactly what I mean. That’s right, I’ll be treating you to a Mighty Vaporizer review today and trust me, this thing is mighty big. Part of the reason behind it’s monumental design though, is the fact that it’s got some really impressive battery power beneath the hood. Let’s get this show on the road and dig a little deeper into what this beast is really about. So, the Mighty is a portable hybrid (convection and conduction) vaporizer, brought to us by Storz and Bickel of Volcano Fame. The Volcano was a desktop vape which really made some waves in the dry-herbing community and we were impressed by the economy and performance of the product. Given the size of the Mighty, I’d see it as more a of a device for communal dry herbin’, as toking on this baby alone would just look like overkill. It promises to provide some of the best battery life and I can’t wait to test that notion out during this Mighty Portable Vaporizer review. Before I get started, because of the high price tag on this type of vape…I’ve spotted a good number of clones on the market, some perform well but most are a danger. Short of doing a full Mighty Vaporizer Clone review let me give you a little heads up. A shined plastic finish instead of a brushed one, lack of S and B insignia on the included herb grinders and o-rings in any color other than light blue are sure signs of a cloned device. It’s not all about saving cash: saving your own health is just as important when it comes to vaping. While RDA and tank clones are often worth our while to check out, you’d do better to to purchase an original when shopping for a device of this caliber and complexity. Let’s get started with this review. Speedy Charge / Good Battery Life: While charging only takes 2 hours, the battery actually lasts almost that long, a full hour and a half. Also, the device supports passthrough charge so this thing is super nifty at home, where you can use it plugged in. LCD Screen and Controls: The screen displays battery charge, your desired temp and your actual temp. Plus and Minus buttons either side of the screen allow you to control temp. The Only Portable Vape With A Medical License: This is enough to ease the minds of paranoid vapers who might be wondering whether that abundance of black plastic is somehow toxic. The answer is: no! Vape Quality: Outstanding and far above average for this style of device, rich, full, flavorsome and effective. The 90 minute battery life will be more than enough between you and a small group of friends. I found the airflow to be easy and open and throughout my review, which lasted a long weekend, found the performance to be incredibly consistent. It knows what to do and does it well. A steady draw is recommended so as to keep a consistent temp throughout the chamber. Fast Heat Up: Takes about two and a half minutes to reach maximum temperature, which isn’t bad at all. Efficiency: If you regularly stir your bowl to maximize conversion, you’ll find that the same dose that would usually mellow you out…on the Mighty, will blow your mind. Use caution and start slow. A warning to first time dry-herbers…do not under-estimate the enhanced efficiency of ‘erbage consumed through this machine!!!! Start on a lower temp, just to keep your wits about you...especially when herbing medically. Looks: There’s not much that can be said on this front but as with so many dry herb vapes like this, it’s about functionality over looks. I enjoy a good diss though, so let me just say: it’s ugly, it's black, it’s surface captures dirt in the grooves…it looks like a satellite phone or some totally obscure tech from the 80’s. The screen is so very old school, digital-watch-esque that, during this review, it really took me back some years. After a few hits though, it grows on you and you learn to love it, regardless. Wall Charge: Yup, sadly no USB charge. Fill: The device doesn’t stand up because of a rounded underside, which is counter-intuitive and makes filling a bit of a saga. The cooling chamber needs to be twisted off, the chamber stacked and compressed, all of this whilst holding the entire device in hand…tricky. Cleaning: Indeed, The grooved surface attracts dirt (especially when camping) and the entire device will definitely require a regular deep cleaning. This video will help you with that! The large size of the bowl on this vaporizer means that it’s better suited for use amongst friends (with similar medical ailments, no doubt) and filling up with a one man dose might not produce the desired vapor. Well, Storz and Bickel is a high end German vaping brand with legendary models like the Volcano and the Crafty under their belt. They’ve gone the extra mile with this product by actually having it medically licensed…now that’s something no other brand has given you! One thing I can definitely say is that, in spite of the rather questionable looks of this piece and my judgmental comments when my Mighty first arrived…I’ve been massively impressed during this review for Mighty Vaporizer and I can, very highly, recommend this vape for medical users, communal ‘erbers and just about anybody who really wants to get the most out of their medicine. Excellent battery life and outstanding, flavorsome vaping on this beast set it apart as possibly one of the most efficient dry-herb vapes on the market. Go get one!